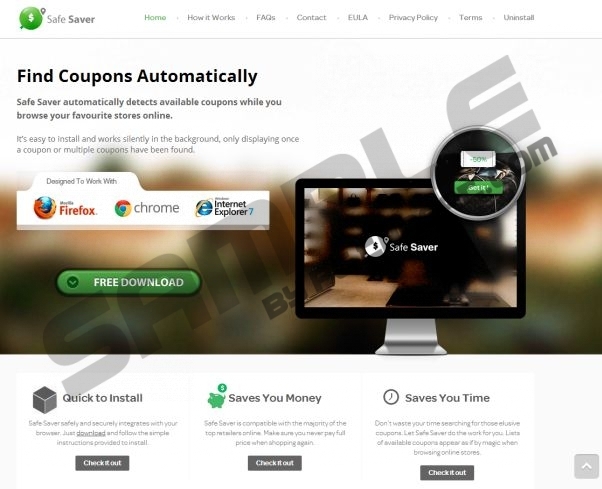 Safe Saver is a browser plugin developed by Brightcircle Investments Limited. The application is available from safe-saver.com; however, it would not be surprising to find it bundled with other software. The extension jumps onto the bandwagon of browser plugins which supposedly can help you save money. Would you want to download a program which promises you to find the best saving deals when you simply browse the web? Many people would, and this is why thousands are now dealing with undesirable removal processes. Even though, the plugin is not considered to be malicious, advertisements supported by it should be handled with care. And if you wish to avoid any risks, getting Safe Saver removed is exactly what you should perform. The Safe-Saver plug-in collects information through cookies and other technologies to assist us in delivering you relevant advertisements. We are working with third-party advertising networks and advertisers who help deliver these advertisements to you. We do not share your non-public personal information with these third parties, but we may share anonymized or aggregated information with them to improve the relevancy of the ads you see. Since third parties can use completely separate privacy policies, it may be dangerous to click on the ads, pop-ups and saving deals supported by Safe Saver. This is particularly dangerous if security tools are not installed to safeguard security vulnerabilities or remove attacking malware. Remember that in some cases the presented advertisements could route you to unfamiliar websites and ask you to enter specific information. If at any point you feel suspicious or you do not feel comfortable disclosing the requested information, you simply should leave the source or ignore the displayed advertisement. You particularly need to be cautious about any additional links presented in these unfamiliar sources because you do not know who manages them or what you could face by clicking on them. You can delete Safe Saver from the computer using the manual removal instructions presented below. Once you perform this you should be extremely cautious about how your browser works. Have you noticed that it is running slower than usual? Do you face abrupt redirections or the irritating adverts continue popping up? If this is what you face there is a possibility that adware continues running on the PC. If you do not know how to detect or delete adware or you wish to ensure full-time Windows protection, you can click the download button below to acquire a legitimate, automatic malware remover which will assist you. How to delete Safe Saver? Navigate to the Task Bar, click Start and then Control Panel. Double-click Add or Remove Programs to locate all of the installed programs. Find the one you wish to delete, click it and select Remove. Move to Uninstall a program and right-click the one you wish to remove. Select Uninstall and perform any additional steps you may need to perform. Tap the Windows key to access the Metro UI menu and right-click. Select All apps and open the Control Panel. Move to Uninstall a program and right-click the program you wish to remove. Quick & tested solution for Safe Saver removal.